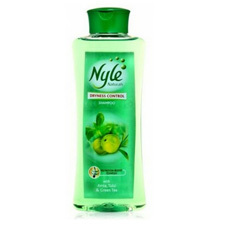 Buy Cavinkare Nyle Naturals Dryness Control Shampoo. Moisturizes your hair naturally, Controlling dryness and the damage. Every drop of Nyle Shampoo contains a unique Nutrition-boost complex, filled with the goodness of Amla, Tulsi and Green Tea. Nyle Naturals Dryness Control Shampoo moisturizes your hair naturally, controlling dryness and the damage caused by it. Tulsi: Tulsi helps in maintaining a healthy scalp and hair. Amla: Amla contains vitamin C which makes your hair soft and silky. Green Tea : Green tea, rich in anti oxidant, naturally protects your hair from dryness.